And like the fate of the Twins and the Vikes, this culinary tradition is rife with controversy. Where to get it, how to cook it, how to eat it and where the best comes from are subjects of heated debate throughout the state and beyond. There are even those that claim the best sweet corn comes from, gasp, Iowa. Any time people sit down to eat sweet corn, it’s obligatory for each person to testify as to when and where they had the best corn ever. I have a friend who insists that South Carolina has the best sweet corn. His evidence, the best he’s ever had came from his grandfather’s farm there. That makes sense, because the best sweet corn comes from the field that’s closest to your table. As soon as it’s picked, the sugars in the corn start breaking down into starch and it doesn’t take long for it to become more suitable for pig fodder than your dining room table. 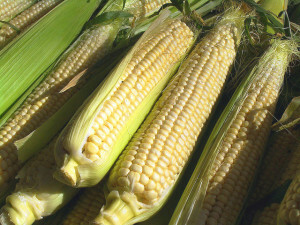 I shake my head when I see people at the supermarket buying sweet corn in early june. That stuff’s been on a long truck ride from Mexico folks, it’s going to be slightly sweeter than styrofoam. My preference for purchasing is from the back of the farmer’s pickup. As for cooking methods, I’ve encountered dozens and they vary from the overall method to any number of special additives, guaranteed to enhance the sweetness, flavor, tenderness. Soak it in water and grill it in the husk, microwave it in the husk, add vinegar an sugar to the boiling water, grill it post shucking, roast in an open fire, or on the manifold of your F100. OK that last one’s not real as far as I know. The truth is, that if it’s good sweet corn, picked on the same day, you can pretty much boil it in plain water, salt it and slather it in butter and it’ll be crazy delicious. And by that I mean better than if you put a lot of butter and salt on a stale piece of bread, which is pretty good too. There are divisions along the lines of preferred eating techniques too. Some like to use little handles that attach with spikes to the ends of the cobs, allowing them to handle it without burning fingers or getting them greasy with melted butter. These implements come in various styles, anthropomorphized corn cobs, trendy modern designs, front and rear halves of farm animals and on and on. My favorite is the unicorns that use their horns to attach to the cob. That just works on so many levels. Others prefer to suffer for their sweetness and brave the scalded greasy fingers. I once bit into one of the spikes from a corn holder and the memory of that nasty sensation has kept me away from them ever since. Do you eat your corn one row at a time, the long way, before rotating it and starting a new row? Or do you go around the circumference before moving on? I’d like to see a study of what that choice has to say about your personality. Now if you’ll excuse me, I need to use my corn cob shaped toothpick. Wonderful and informative. Corn is a ritual this time of year and I’ve had great corn in Michigan (my Grandma’s ‘Golden Bantam’) Minnesota and Canada. Of course, the local AZ corn is very good too. The key is, is it FRESH?! LOL, yes we all get into best sweet corn stories, but I have to say with the new hybrids that are bred to keep their sugars and not convert them to starches, I’ve had decent corn from the grocery store in June (usually from Florida or the Carolinas around here), eaten great corn that was 3 days past its purchase at the farmers market, and, alas, had wholesale corn from the “back of a farmer’s truck” that was really a ploy of a wholesale distributor. Of course, that was in rural MD where the sweet corn traditions are not so strong.